Are you tired of the extremes dominating the debate? Angry about hyperpartisans hijacking American politics? Well, Jon Stewart has a rally for you and me. The Rally to Restore Sanity is slated for October 30, the weekend before Election Day, on the Washington Mall. I'll be there. Hopefully, you'll be there to. Food for thought. As Bonddad said a week ago, we try to keep this blog as apolitical as possible and focus on economics. As you can guess from my nom de blog, my politics are very populist. If it were up to me, there would have been a new New Deal in the last two years, with a new WPA, the reinstatement of Glass-Steagal in full, the full regulation of commodity indexes, cracking down on leverage and the banning of synthetic derivatives, a VAT to combat the trade deficit with proceeds rebated to all citizens, and steeply progressive increases in income and estate taxation especially over $1 million in income or $10 million in estates. Plus a countercyclical mandate for surpluses during economic expansions to fund deficits during recessions. But that is simply beyond the pale for the Versailles political establishment, and writing long manifestos bewailing that situation strikes me as no more than narcissistic intellectual autoeroticism. So I stick to what is, not what I think should be. What is, is that the recession bottomed 15 months ago, as determined by the NBER. The economy is expanding, although in a way that has only returned something like 10% of the jobs lost in the recession, and making very little progress in income for most Americans. 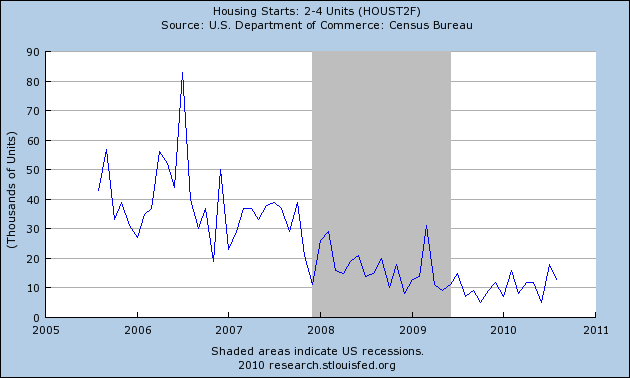 What also is, is that housing sales appear to have bottomed, although there is precious little bounce back. Leading Indicators for August came in positive, lessening the likelihood of any "double dip" this year (and so far September's look like they may be even better). High frequency weekly indicators are continuing to suggest that the possibility of a double-dippette is decreasing. The Mortgage Bankers' Association reported that its Refinance Index decreased 0.9% from the previous week, as slightly higher mortgage rates continued to dissuade applications, while the seasonally adjusted Purchase Index decreased 3.3% from one week before. Purchase mortgage activity remains significantly above its July lows for the third week in a row, however, it is still almost 40% lower than it was one year ago.. The ICSC reported same store sales for the week ending September 19 decreased 1.4% week over week, and up 3.3% YoY, returning to its stronger YoY performance from the last several months. Shoppertrak also reported that for the week ending September 18, YoY sales rose 3.3% percent from a year ago. The consumer remains alive and kicking. Gas prices remained steady at $2.72 a gallon, and at 8.847 million usage again was virtually identical to one year ago. Gasoline stocks continue to be in or near record territory, strongly indicating some amount of hoarding of supply. The BLS reported 465,000 new jobless claims, the first increase in three weeks. The four week average declined to 463,000. The question becomes whether this metric can resume its advance from last year's levels, or whether it will again be mired in this range. Railfax showed rail traffic generally improving slightly last week. Economically sensitive waste and scrap metal continued to run below last year's levels, and autos loads are going sideways. The American Staffing Association reported that for the week ending September 5, temporary and contract employment increased slightly, but remained rounded at 96.0, indicating this month some slackening in its growth. 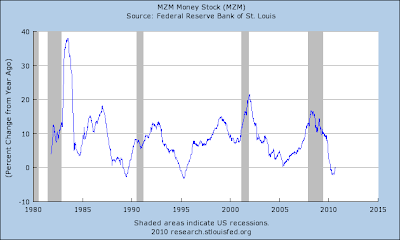 M1 decreased -0.70.5% in the last week, but increased about 1.5% month over month, and up 6.0% YoY, so “real M1” is up 4.8%. 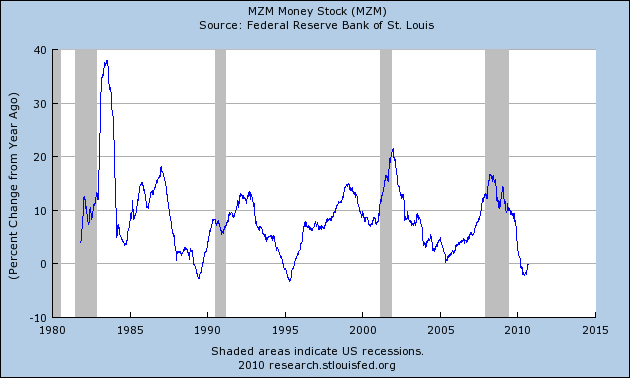 M2 increased very slightly in the last week, +0.5% month over month, and up 2.7% YoY, so “real M2” is up 1.5%. Real M1 still strongly indicates no double-dip recession, and real M2 has been generally improving in the last few months, but is still under 2.5% YoY which would get us into the green zone. Weekly BAA commercial bond rates rose for the third week in a row, up another .06% to 5.73%. This is still a very low rate and is rising in tandem with other bond rates. Fifteen days into September, the Daily Treasury Statement is up $104.5 B vs. $95.3 B a year ago, a gain of ~9.7%. For the last 20 reporting days, withholding taxes are up $129.1 B vs. $119.1 B a year ago, for a gain of ~8.3%. This remains a very good showing compared with the last few months. Weekly indicators generally are suggesting slow growth but no double-dip. 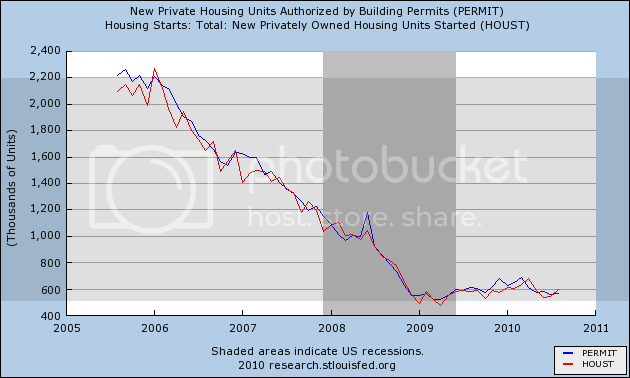 A decrease in the price of Oil, or a modest increase in new housing starts would be welcome, but don't look like they are in the cards in the immediate future. Is A Trade War Brewing With China? But Prime Minister Wen Jiabao barely budged beyond his familiar talking points about gradual “reform” of China’s currency policy, leaving it unclear whether Mr. Obama’s message would change Beijing’s economic or political calculus. Democrats in Congress are threatening to pass legislation before the midterm elections that would slap huge tariffs on Chinese goods to undermine the advantages Beijing has enjoyed from a currency, the renminbi, that experts say is artificially weakened by 20 to 25 percent. Mr. Obama’s aides said he was embracing the threat of tariffs and new trade actions against China at the World Trade Organization to gain some leverage over the Chinese, but was also trying to head off any action that would lead to a destructive trade war. While the United States has been pressing China for years to lift the strict controls on its currency, which keep Chinese exports competitive and more factory workers employed, American voters and lawmakers have only recently seized on exchange rates as a potent political issue. Mr. Obama pressed much harder on Thursday than during a visit to Beijing last year, perhaps because a Chinese commitment several months ago to allow the value of the currency to rise has resulted in a change of less than 2 percent. 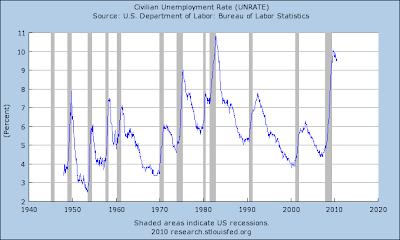 Note that while the LEIs are still increasing, the rate of increase (raise your hand if you remember "rise over run") is decreasing. 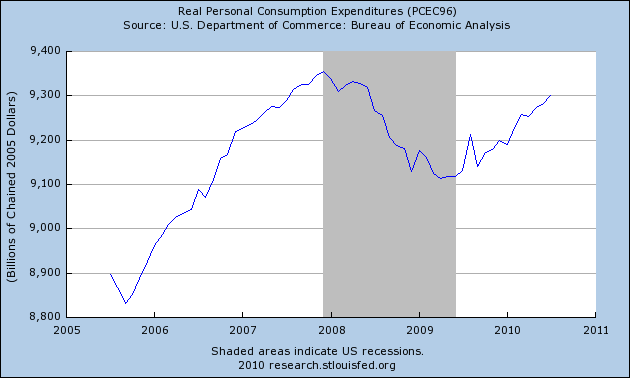 This is the reason the release includes a statement that the economy will be growing slowly. Also note the same situation applies to the coincidental indicators. 7 of the 10 indicators were positive. Above is a chart of coincident economic indicators. What is interesting in the lower chart is that we've only seen four negative contributions from the components in the last six months and three of those were from employment. This indicates the current conditions are at worst fair. Yesterday, stock prices closed below two important technical support levels (a and b). Yesterday prices gapped lower at the open and then rallied to levels established yesterday (g). volume decreased as prices moved higher (d) indicating a lack of enthusiasm as prices rose. Prices then moved lower until then hit support at (f) (yesterday's lows) , and then prices moved lower (c) on increasing volume (e). The 20+ year Treasuries are above important levels. Notice that as the Treasury prices rise the stock market looks less interesting. This has been a common theme for the last few months. 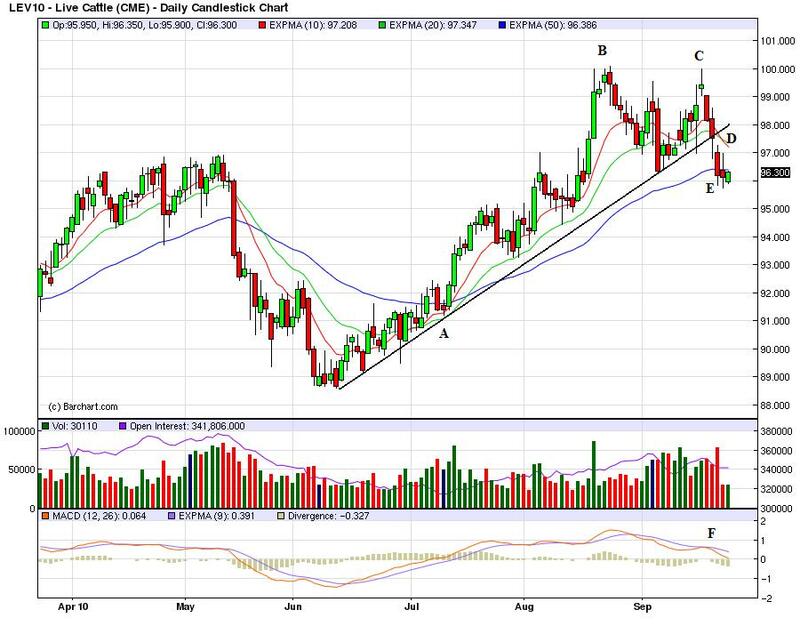 Cattle -- which was in a strong uptrend (A), has printed a double (B and C) top and broken the uptrend (D). Prices are now sitting at the 50 day EMA (E). Also note the MACD has given a sell signal (F). 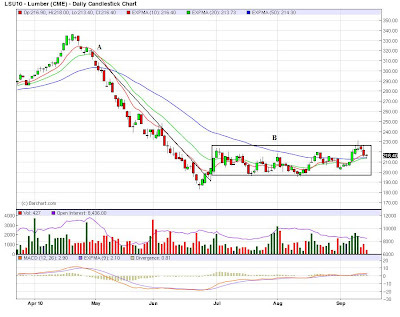 The lumber market -- which had a consistent downtrend earlier this year (A) is still consolidating in a base (B). 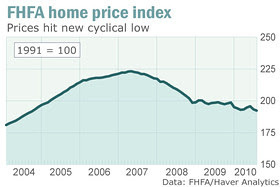 The market is obviously strongly influenced by the housing market. As Europe’s major economies focus on belt-tightening, they are following the path of Ireland. But the once thriving nation is struggling, with no sign of a rapid turnaround in sight. Ireland failed to emerge from recession after its economy contracted in the second quarter, putting further pressure on the country’s government to deal with its struggling banks. The Central Statistics Office said on Thursday that gross domestic product fell by 1.2 per cent in the three months to the end of June. This compares with growth of 2.2 per cent in the first quarter. I realize that data is anathema to political discourse now; ideology trumps all. But, in the wild hope that data (you know, facts and figures) actually matter to someone, the above facts do not bode well for austerity. 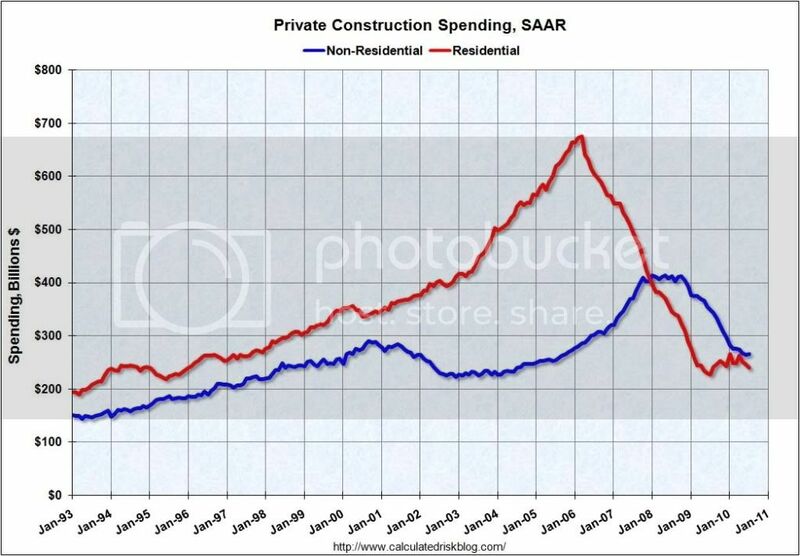 I'm sure it's too early to say that nonresidential construction has bottomed, but a few items make me believe it is time to start watching. Yesterday Bill McBride a/k/a Calculated Risk treated us to his monthly recap of architecture billings, with his usual note indicating that nonresidential construction would continue to decline for the foreseeable future. I'm not so sure. 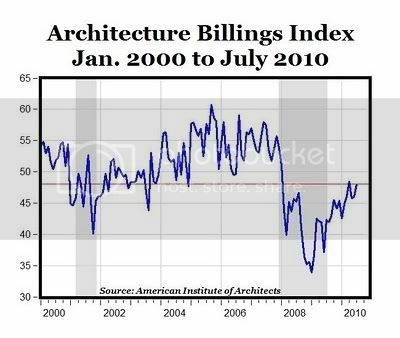 Note that the most recent reading of the AIA is consistent with readings in early 2002 and early 2003. 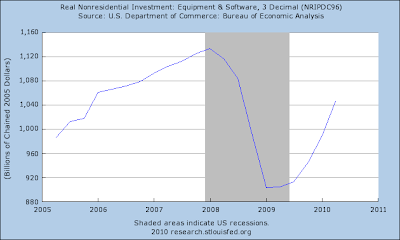 Note that in early 2002 nonresidential construction was still declining, but in the second half of 2002 it stabilized and remained flat throughout 2003. This makes me think that the AIA index may be similar to the ISM manufacturing index. Both are diffusion indexes, with 50 being the dividing point between most businesses reporting an increase vs. a decrease. But the ISM says that its index signals expansion before the index reaches 50. Several months' readings at 46 (the actual number may even be lower, I didn't go back and check), are sufficient to signal expansion. The 2002-03 readings of the AIA index suggest the same may be the case. This series appears to have made a bottom in July. If it isn't the bottom, it at least is probably very close in time and value. At least some of those loans must be for new construction. While it is probably too early to say that nonresidential construction has stabilized, it looks like it is time to watch for a bottom. Is a Trade War Brewing Between the US and China? Democratic leaders in the House of Representatives will move ahead with a bill allowing the US to retaliate against China for manipulating its currency, a significant escalation of the dispute between Washington and Beijing. Sander Levin, chairman of the ways and means committee in the House of Representatives, said on Wednesday the bill would be compatible with World Trade Organisation rules. But in a largely untested area of trade law the measure will evoke opposition from Beijing and could lead to a legal challenge in the WTO. The bill will go to committee on Friday and could be voted on by the full House as early as next week. Hours later, Wen Jiabao, the Chinese premier, told business leaders in New York that pressure on Beijing was unwarranted. “The conditions for a major appreciation of the renminbi do not exist,” he said. If the renminbi were suddenly to rise by a large degree against the dollar, “we cannot imagine how many Chinese factories will go bankrupt, how many Chinese workers will lose their jobs, and how many migrant workers will return to the countryside... China would suffer major social upheaval”. China unpegged the renminbi on June 19 and allowed it to appreciate after two years of holding it constant but has intervened in the currency markets to slow its rise. 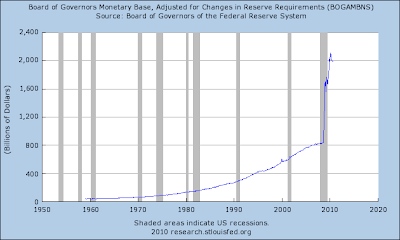 First, let's start with the blatantly obvious: China manipulates the hell out of its currency. Secondly, the US has not acted on this for reasons unknown. Personally, I think the US is scared to play a game of international relations chicken with the Chinese. However, I can't prove this; that statement is pure conjecture. Third: China has grown as a direct result of its manipulation. China has developed a pool of investment funds as a result of purchasing currencies on the open market to prevent a run-up in the Yuan's value. As such, they have been able to go around the word and invest in all sorts of infrastructure projects in South America and Africa to develop and extract raw materials to export to China. Fourth: China does not want to lose its funding source. However, it is probably near the point where the fund -- if prudently managed -- has become self-funding; that is, it is so large that the return on assets is in the multi-millions of dollars on an annual basis. In essence, it operates something like an endowment fund for a large collage or university. Fifth: while the Chinese have said they would let their currency rise, this is a promise made before major world leader get-togethers to make it look like the Chinese are doing something, only to have the Chinese not act on their promise when the confab is over. In other words, their recent promises to act on the Yuan are public relations with no policy action. How will this end? I have no idea. While prices moved over key resistance at the beginning of the week, they have since retreated. Ideally, we'd like to see prices move above this and then "retest it," which means prices fall back to the line but don't do through. Yesterday, prices printed a strong downward bar. On the 5-minute chart, notice that prices are at important technical levels: key levels set 5 days ago and Fibonacci levels. Yesterday's action was pretty straightforward; prices moved in a downward sloping pennant pattern in the AM and the consolidated in a tight range during the afternoon. On the other side of the street, Treasuries are again getting attention. The 7-10-year part of the market is moving higher and is about to test the upward sloping trend line of the last 5 months. Prices at the long end of the curve are back above important levels. For the last 4-5 months, the primary issues has been, "is the Treasury market taking money from the equity markets and is this preventing upward progress in the equities markets?" I believe the answer to both is, "yes." As such, the recent moves in the Treasury market do not bode well for the stock market, instead indicating prices are headed lower into the trading range they've been in for the last few months. Gold is now meaningfully past previous resistance in area (a). This means gold is probably moving higher in a strong way. Oil is still in a trading range (A). Prices have recently rallied to the 50 day EMA (B), but have since sold off (C). The EMA picture is slightly bearish: the shorter EMAs are heading lower and are below the 50 day EMA, and prices are below all the EMAs. However, the EMAs are also in a fairly tight range and prices have been in a trading range for almost four months. Copper recently formed an upward sloping wedge pattern (A), which prices broke through two days ago (B). The EMA picture is very bullish (A), but the MACD is a more neutral than we'd like for a strong upward rally. Information received since the Federal Open Market Committee met in August indicates that the pace of recovery in output and employment has slowed in recent months. Household spending is increasing gradually, but remains constrained by high unemployment, modest income growth, lower housing wealth, and tight credit. 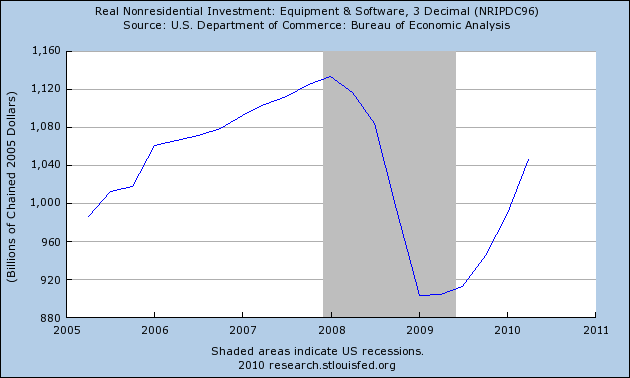 Business spending on equipment and software is rising, though less rapidly than earlier in the year, while investment in nonresidential structures continues to be weak. Employers remain reluctant to add to payrolls. 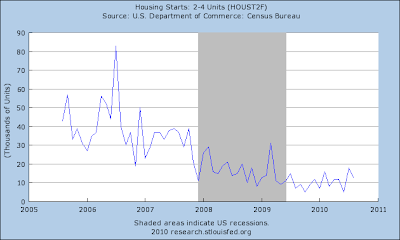 Housing starts are at a depressed level. 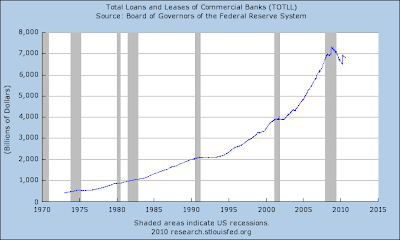 Bank lending has continued to contract, but at a reduced rate in recent months. The Committee anticipates a gradual return to higher levels of resource utilization in a context of price stability, although the pace of economic recovery is likely to be modest in the near term. 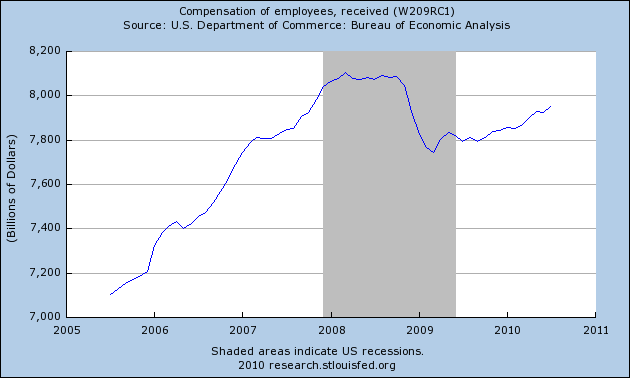 Weak wage growth (compare the slope after the recession to that before the recession). but they are reluctant to hire. Short version; things are moving forward, but slowly. Corporate debt-default rates are expected to fall to the same levels that preceded the financial crisis of September 2008, marking a swift turnaround for the fate of the most troubled U.S. companies. The U.S. default rate should fall below 3% by year's end, according to Moody's Investors Service, a stunning drop from the 14.6% peak of November 2009 and even below the default rate of 3.1% from August 2008. The default rate measures the percentage of companies with "junk" credit ratings that failed to meet debt obligations during a trailing 12-month period. The rate's decline suggests the corporate bloodletting set off by the collapse of Lehman Brothers Holdings Inc. is at or near its end. 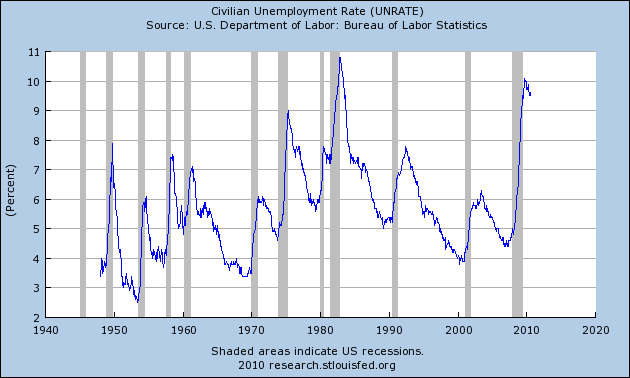 That should bode well for the nation's unemployment rolls, which swelled after the collapse of such companies as Circuit City Stores Inc., Linens N' Things Inc., and Nortel Networks Corp. in 2008 and 2009. "In the near term, we seem to have overcome the last wave of restructurings—faster than anticipated," said Michael Henkin, co-head of restructuring at Jefferies & Co. "Things came back pretty quickly, and the capital markets have solved a lot of the concerns that were out there on corporate defaults." More signs the economy is on the mend. Along with Oil, because it is a leading sector housing is the area of the economy I am most concerned about in terms of sustaining the recovery. As to sales, on the one hand there is now substantial evidence that it has bottomed, but on the other hand there is little evidence of a significant rebound. Permits did rise slightly (10,000) and starts rose significantly, but both are below 600,000 seasonally adjusted units annually. They had been above 600,000 in the early part of this year. Meanwhile, this morning the Mortgage Bankers Association reported that purchase mortgage applications declined 3.3%. This was still 9% above the low of two months ago, but almost 40% below one year ago. 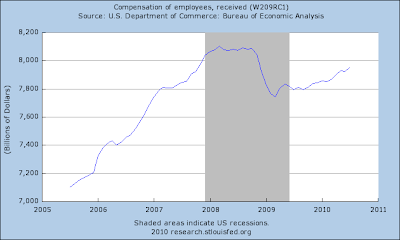 In short, there is only a slight rebound off the bottom. The cliff-diving of 2006 - 2008 is over, but we have given up between 50,000 to 100,000 units annualized from the pace that was established one year ago. This is an important reason why I expect GDP growth in the next quarter or two to be sluggish, and possibly even slightly negative in one quarter. 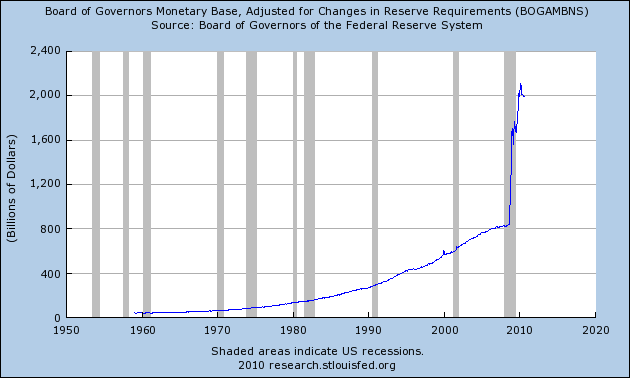 Is the Federal Reserve Propping Up the Economy? 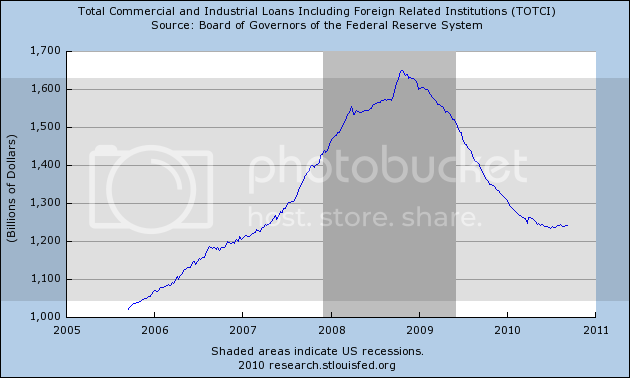 There are times when the internets promise is greatly undermined by its propensity to spread conspiracy theories, one of which is "the Federal Reserve is propping up the economy." Let me explain why this is false. "Money with zero maturity. 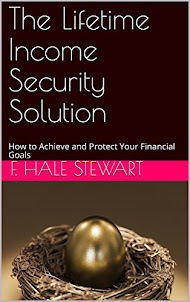 It measures the supply of financial assets redeemable at par on demand." 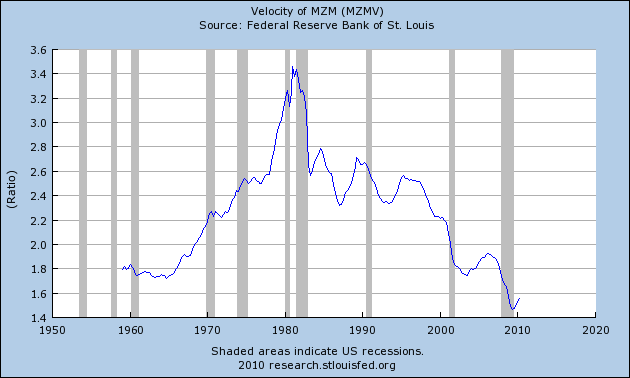 It's velocity is the slowest its been in over nearly 50 years. 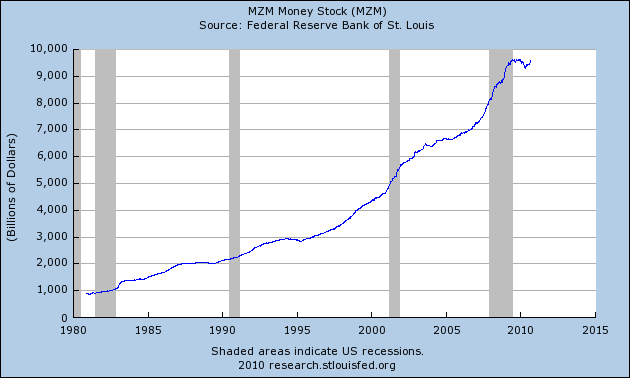 In short, the Fed is not "propping up the economy." 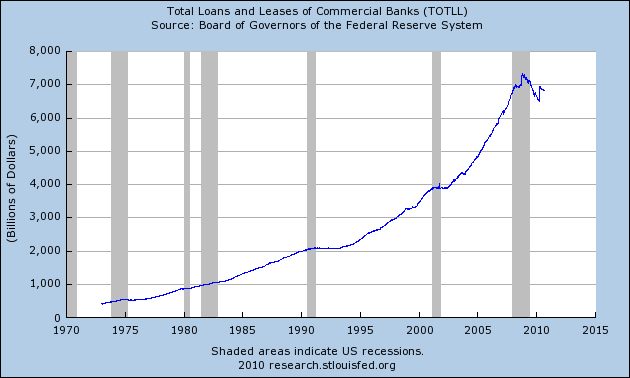 While the Fed is purchasing large amounts of bonds, those purchases are not getting into the public's hands because banks aren't lending money. 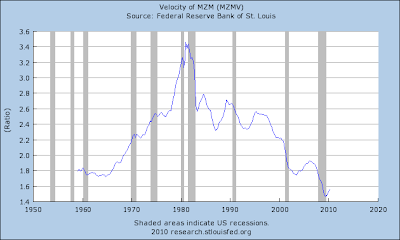 In fact, the growth of the MZM was recently negative and its velocity is near 50 years lows. Prices are above important technical levels still (a). 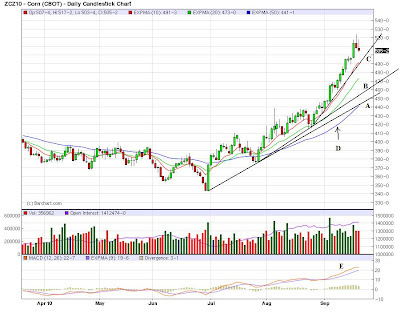 In addition, the EMA picture is strong (b)-- the shorter EMAs are above the longer EMAs and the 10, 20 and 50 day EMA are rising. 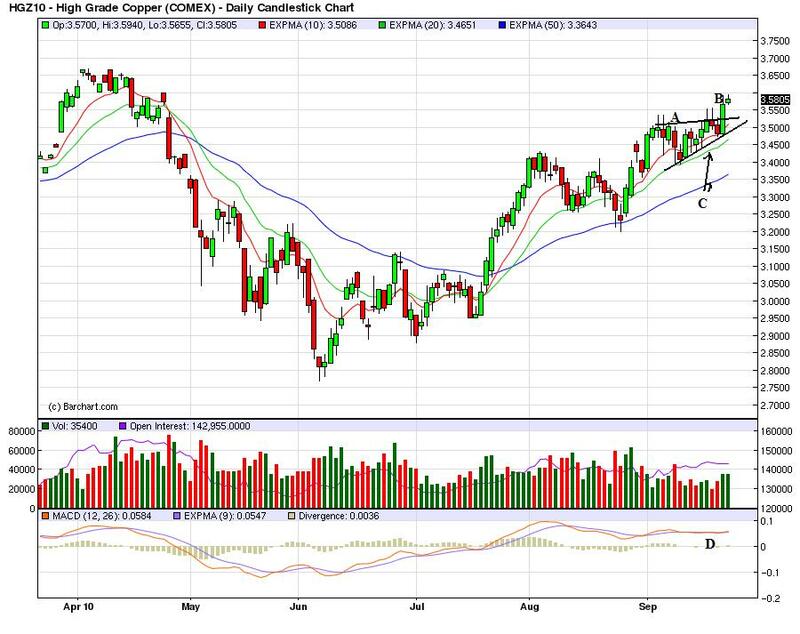 Prices are above the 200 day EMA. Also note that volume has been increasing for the last week or so (c). 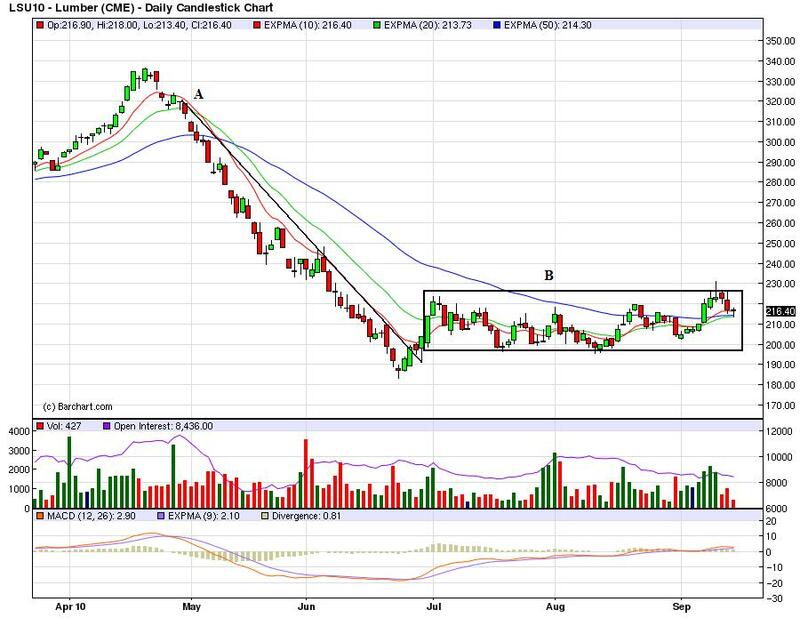 The underlying technicals are strong - the A/D line is rising (a) and the CMF shows a net inflow of cash (b). Also note momentum is positive (c). Last week, prices consolidated (a). Yesterday they rose (b) and today the held steady (c). On the down side, bonds rallied strongly yesterday (a) on the Fed's decision. This will take some money out of equities. In addition, bonds are in a clear upwardly sloping position (a). Today prices gapped higher at the open (b) and then rallied strongly after the Fed's decision (c). Corn's rate of increase in getting steeper -- note the progressively steepening angles (A, B and C). The EMA picture is strong (D, all rising) and the MACD indicates upward momentum (E). 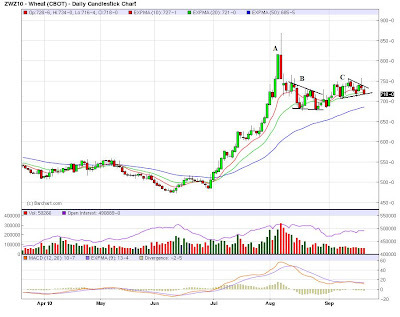 Cotton is also in a clear uptrend (A), accompanied with strong upside gaps (B) and a positive EMA picture (C). Also note the MACD has popped higher (D). 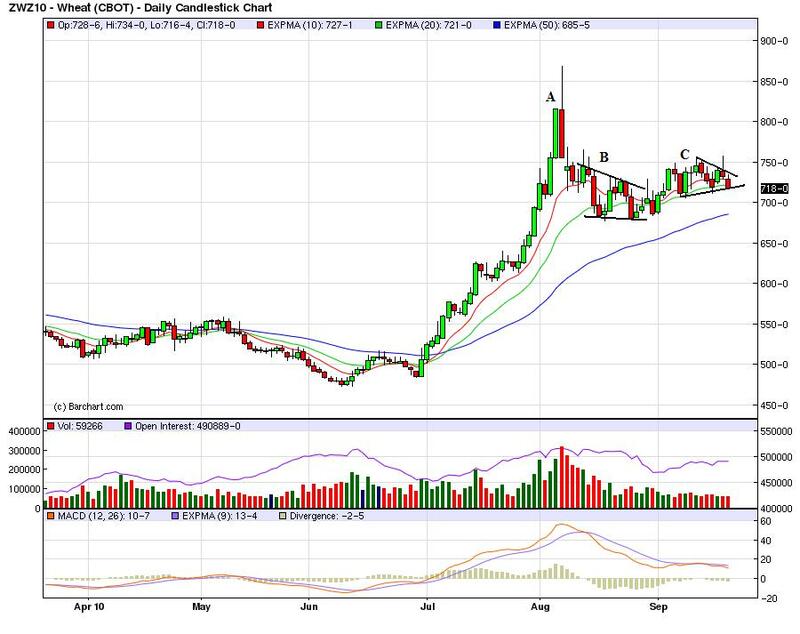 After moving strongly higher (A), wheat is consolidating in two triangles (B and C). The above charts of the municipal bond market, mortgage, junk and investment grade corporate bond markets all indicate money is flowing into the dent markets; it's not just the Treasury market that is benefiting from the recent move into fixed income. The question now becomes are these markets in the middle of a bubble? The MUBs are right at crucial support and the MBBs are just below support, indicating some technical weakness. 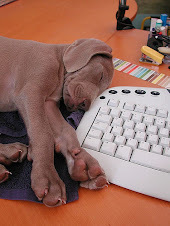 the LQDs have sold off a bit, but still have some technical support. It can't be more straightforward: the more educated you are, the more likely you are to have a job. In every OECD country, without a single exception, a higher proportion of 25 to 64–year-olds with a tertiary level of education are employed than those with only an upper secondary degree. And likewise, those with an upper secondary qualification are generally far more likely to have a job than those with a level of education below that. Across the OECD, some 85% of 25 to 64-year-olds with a tertiary education have a job, compared to an average of 59% of those with a secondary education or less. And the gap grows considerably wider for some countries (see our chart). With notable exceptions of Iceland and Korea, very few countries have managed to shrink this gap down. It works for gender as well. Higher levels of education also bring the employment rates of women up to that of men. Men are generally more likely to be employed than women, but the discrepancy is much bigger among people with low levels of education. While there is no such thing as a guarantee, this is a strong statistical relationship that exists over different countries. Left to its own devices, I suspect the economy would succumb to a deflationary spiral. But Ben Bernanke and the Federal Reserve know this as well: Bernanke is a scholar of Federal Reserve mistakes during the 1929-32 Great Depression. He is resolved not to make the same mistakes that were made then .... He is aiming a veritable monetary firehose at the deflationary vortex, hoping to flood it with money and so overcome the incipient deflation. There is at least some hope [that] ....a new Administration in Washington populated by Economic Adults may unfreeze the logjam of money supply sitting in banks and not being lent out. Certainly there is a pressing need for massive infrastructure investments that can lead to renewed bank lending and economic expansion on Main Street. Yes there is Hope for an Obama Economic Recovery in 2009. For purposes of this discussion, I am going to assume that the optimistic scenario turns out to be the correct one: viz., that the YoY inflation rate will bottom in about July 2009 and that will mark the end of the recession and the beginning point of any recovery. This week's decline increases the likelihood that the recession is very close to bottoming to more than 50%. .... the NBER may ultimately date the end of this recession from June or July of this year. there are plenty of reasons, those listed above not being in any way exhaustive, that people like us are saying that the economic situation looks like it is getting ready to improve. By the end of August we were both confident, and correct, enough to write bluntly that This Recession is Over. 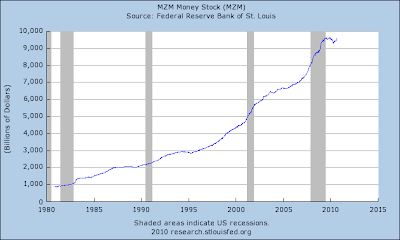 ....-"...the economy is leaps and bounds away from anything remotely resembling a recovery." "Some Green Shoots supporters have declared that the bottom is in. They point towards various short-term trends, and if you don't look too close, it appears to support their cause.... If you look hard enough you can find Green Shoots, but do they actually exist in the real world? 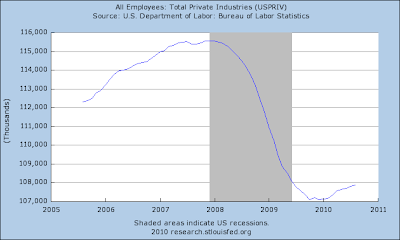 Sadly, no..
IMHO, more likely than not, these are the realities of our economy heading into the last four months of the 2010 election cycle. In short, there can't be a double-dip recession if the Great Recession never ended, in the first place. Yesterday the NBER settled that debate. They confirmed that the Pied Pipers of Doom were wrong. At the very time they were writing the above bombasts, the economy had begun to recover. More importantly, Bonddad and I were right in calling the bottom of the Great Recession -- not just contemporaneously, but months in advance. 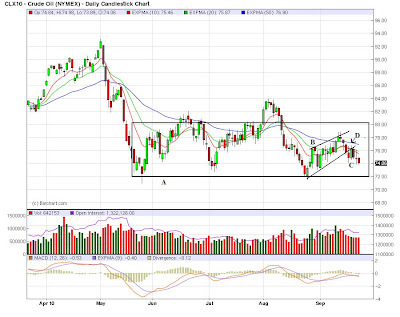 Prices gapped higher at the open (a), wuickly consolidated in a downward sloping pennant pattern (b) and then rallied strongly (c) before again consolidating. Prices next formed a double top (e) before selling off to just below the 20 minute EMA (f). Prices then consolidated their gains in a triangle pattern (g) and then rallied strongly into the close on rising volume (h). The SPYs finally made some headway above hey resistance levels (a). The IWCs, which also advanced through important resistance levels. The Treasury market rallied as well, moving above the upper line of its downward sloping pennant pattern. Prices are constricted by the EMAs, however. Gold continues its move above key resistance. After bottoming (a), the dollar rallied but ran into upside resistance at the 50 day EMA (b). 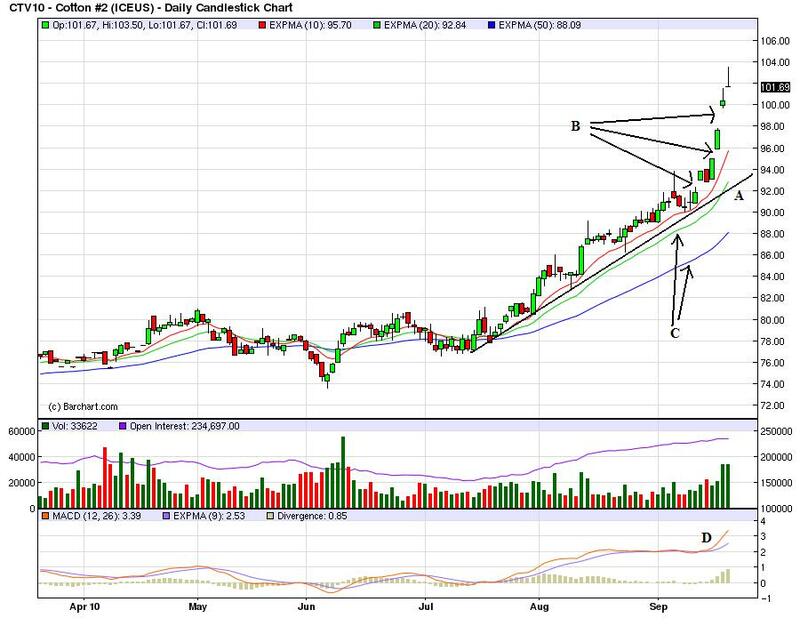 Prices then started to move lower, forming two upward sloping pennant patterns along the way down (c and d). Prices have now consolidated in a triangle pattern, just a bit higher than previous lows (e).